A thread to discuss The Mortis Trilogy arc from The Clone Wars cartoon, and how it can possibly relate to this current trilogy. Purple Ren wrote: A thread to discuss The Mortis Trilogy arc from The Clone Wars cartoon, and how it can possibly relate to this current trilogy. I really liked that trilogy, and how "out there" it was. More like fantasy, and I liked to see that. I hope not to see the son as the evil one and the daughter as the good one, as in Kylo and Rey representing two sides of the Skywalkers, or even of the force. I think they are more complicated than that. Other than that, I can't relate the trilogy much to the ST. It is the premise for a yin yang gray Jedi thing, no? I watched it few times...still not sure what happened there....Daughter is dead, part of her lives in Ashoka....but is the son dead? Or did it all happen on some mental plane rather than in the physical world....didn't watch much of CW but these episodes seemed to stand out from the rest? Also what's up with Ashoka? And the essence of the daughter in her? Can that be important? The interesting thing is that the Son loved Daughter- he was distraught when she died. As Father and Daughter loved him back. Sure they were all personifications of the Force, but Light didn't hate Dark or vice versa. I think that could tie into the ST in a general way, especially if our theories are true and that the ST is about finding balance. I sometimes wonder if Mortis was a sort of elaborate Force vision of Anakin....seeing his future....seeking what could possibly happen to his padawan....the internal conflict within him between the light and the dark....... the future where the dark kills the light i.e. the Daughter (order 66).....then the Father kills himself (Vader's death)...and the Son gets sort of killed (Palpatine's death)...but since he wasn't killed by the Moris dagger, it meant the dark side hadn't really died? @panki wrote: I sometimes wonder if Mortis was a sort of elaborate Force vision of Anakin....seeing his future....seeking what could possibly happen to his padawan....the internal conflict within him between the light and the dark....... the future where the dark kills the light i.e. the Daughter (order 66).....then the Father kills himself (Vader's death)...and the Son gets sort of killed (Palpatine's death)...but since he wasn't killed by the Moris dagger, it meant the dark side hadn't really died? I don´t think he is dead....can Lightsabers kill Force wielders? He LIVES!!! I think the Son is alive too...might not be in corporeal form but the energy still lives for sure! Son is dead. When Father sacrificed himself, that weakened Son to the point that a lightsaber could kill him. If any of them has a chance of living on, it's Daughter, as part of her essence is in Ahsoka. I wonder if we'll see Mortis in any of the movies....maybe in a force vision? Or maybe when Luke or Rey is meditating? I think Mortis is to trippy to come up in a movie. By the way, if anyone is just lurking and haven't seen Mortis, anyone can watch it, you don't need to know anything about TCW, it stands on its on. And it's on Netflix! I just watched the Mortis arc, so I thought I'd bring this back. A lot of food for thought in those episodes. It made me want to compare it to the sequel trilogy, even though there obviously can't be any direct parallels. The most obvious ST parallel appears to be that The Father will be represented by Luke, The Daughter by Rey, and The Son by Kylo Ren. The dynamic of three powerful force wielders sounds like what we are in for in episode VIII. However, I think Rey's role might be more like Anakin's role in this episode, as the next one to bring balance. 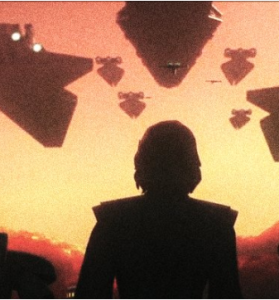 Perhaps, The Daughter and The Son both represent Kylo Ren, since he is conflicted and pulled between dark and light, and Luke and Han represent The Father in different ways. Though, I suppose Han could also be represented by The Daughter, since The Son killed The Daughter. Though, I think The Daughter could represent Ben and The Son Kylo, as well. Or Luke is The Daughter, the light side that prevailed after ROTJ that also currently refuses to interfere, Kylo is The Son, the dark side that rose again, Anakin is The Father, the one who once brought balance but has grown old, and has both dark and light in him as well, and Rey is Anakin, the new one to bring balance. I do think it is interesting how The Daughter said she could not get involved, but then gave Obi-Wan the sword that could kill The Son. I think this could be similar to Luke not getting involved until Rey comes to him with the saber. I suppose in this way Rey is also like The Daughter, though Luke may give the saber right back to her and tell her to defeat Kylo Ren. I think it is interesting that to defeat The Son, The Father killed himself because he knew that it would make The Son weaker. This sounds like how when Kylo Ren killed Han, he felt weakened. Perhaps Snoke's plan all along was to get Kylo Ren to kill Han so that he could weaken him for his own purposes. There are elements of The Father in Snoke, as well. He is tall and controlling everything, but grows weak. He seeks someone new, like Anakin. This sounds like Snoke, who appears tall and old seeking out someone powerful with the force--Kylo Ren. However, I agree that there are also elements of The Son in Snoke, especially with the powers of manipulating and controlling others. I also wonder, since Rey seems similar to The Daughter, but I doubt she will be so passive or so quickly killed, that perhaps she is more like Ahsoka, who was given back her life by The Daughter. Ahsoka's role seemed to be a balance of The Daughter's and Anakin's. It is interesting because Ahsoka was captured by The Son and controlled by him, similar to how Rey was captured by Kylo Ren in TFA. Perhaps, in VIII, Rey will go to Kylo Ren herself, like how Anakin himself goes after The Son. 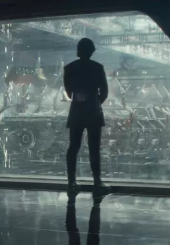 There is also a bit of Ahsoka in Kylo Ren, perhaps, because Kylo Ren leaves his master, Luke, like how Ahsoka leaves Anakin. But there is also the parallel with Anakin leaving Obi-Wan. It was also really interesting when Anakin had to choose between saving his master and his apprentice, though he chose to save both. It makes me think of the potential relationship between Kylo Ren, Luke, and Rey. I feel like Obi-Wan could also be represented by Finn, as the one who chooses to interfere when essentially told not to, even though they prefer not to interfere in the first place. They are also both the one who is first given the sword. Mas gives Finn the saber just like how The Daughter gives Obi-wan the sword. Perhaps Rey will give Kylo Ren the saber like how Ahsoka gave The Son the saber. Perhaps the saber (the blue one, you know) will be Kylo Ren's undoing like how it was The Son's undoing. It already kind of has! Since Rey defeated and scarred him with it. What bothers me most about the Mortis arc is that there is no The Mother? According to Wookieepedia, a book that is now Legends tells a story of The Mother, but it is a strange story and apparently no longer canon, even though Wookieepedia still keeps the information on the canon The Ones page. Perhaps the issue with balance that The Ones are having is that there is no The Mother. But it makes me wonder where Leia and Padme fit into this. Idk where Leia fits, perhaps she will be like The Daughter and get in the way before someone can kill another. I hope not. Padme looks and seems more like The Daughter, she even has a similar outfit at one point, refuses to interfere or blame Anakin, and loves him even though he force chokes her and all that. The Emperor even tells Anakin that he was responsible for her death which upsets Anakin in a similar way to The Son being upset over killing the Daughter. Maybe Leia's role is merged into The Father's role, since she is the one who sends Han to his death to try to stop Kylo Ren and also believed for so long that she and Luke could keep her son from the dark side. The Father thought he could control The Son and causes his own death to try to stop him and weaken him. The parallels are all over the place, of course, because every character really does have both dark and light and grey within them and at times plays all these roles in the force. It is very interesting that The Daughter seemed to focus on forgiveness and not being able to interfere except for the times when she decided she must stop something. The Son focused on leaving the world and joining the Galaxy and bringing peace and owning people. The Father focused on control and balance. It was strange that peace was something that The Son so focused on, because peace is not usually something you think of when you think of the dark side. Of course, you could just see this as manipulation, but I think it also came from a similar desire to control things and own things. But also, The Son seemed more aggressive and The Daughter more passive. It is also interesting that The Father says that both the light and the dark must be "tamed" and that balance was only brought through the death of everyone. And The Son wants to destroy the Jedi and the Sith. The best part of this arc is really that it is so ambiguous and difficult to understand. But I hope that these themes will be more resolved (slightly) in the ST.
Also it is driving me crazy how much The Son looks like The Grand Inquisitor. I've seen it talked about a lot on the internet and still don't know what to make of it. Well, just like how the Mortis arc seemed to be a bad dream by the end of the episodes, this whole post felt like a crazy dream during a spoiler drought. I can't wait to see how the dance between the dark side and the light finally plays out in this ST.
@jakkusun wrote: I just watched the Mortis arc, so I thought I'd bring this back. A lot of food for thought in those episodes. It made me want to compare it to the sequel trilogy, even though there obviously can't be any direct parallels. You've brought up some interesting points I never even considered like Finn being the equivalent of Obi-wan keeping the dagger that the daughter gave him, and even the question of where the Mother fits into all this. I personally don't feel the Father, Son and Daughter are manifesting as real characters in the ST but are found to different degrees in all of them. The Mother is different. She never was a celestial but a human who turned monster when she tried to gain powers to stop her children fighting. So to me, Rey is definitely Anakin- with potential for good and evil, the chosen one; Finn is Obi-wan- he holds the lightsaber till Rey needs it and wants to do the right thing; Kylo is Ahsoka- someone inherently good who gets bitten and corrupted by the dark side and returns to the light after being betrayed by the dark. Finally, Snoke could be Mother- if we look at all the big villains of SW, they all start off with the desire to help the galaxy and lose their way....Snoke could potentially be one such character. I'm not including Luke here because technically, the ST belongs to the new characters and not the OT. @panki I like those parallels a lot! Makes so much more sense! Someone just mentioned it on another thread, but it was announced at a Comic Con panel that Clone Wars is coming back for 12 episodes on the Disney streaming platform. There are some clips online that show the standing ovation the announcement got. 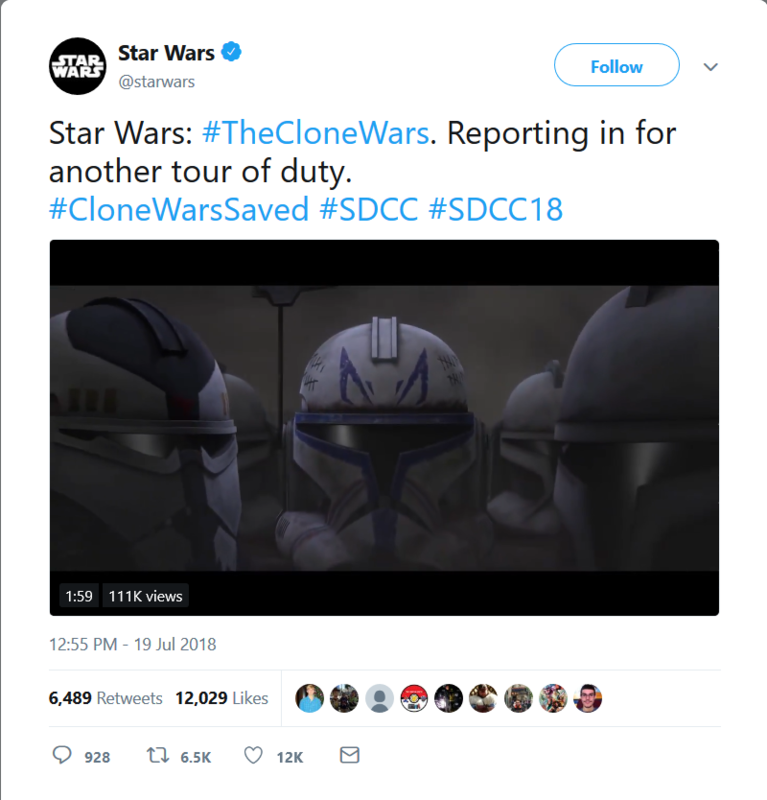 @californiagirl wrote: Someone just mentioned it on another thread, but it was announced at a Comic Con panel that Clone Wars is coming back for 12 episodes on the Disney streaming platform. There are some clips online that show the standing ovation the announcement got. They will finish what they started. A damage control for sure but a welcome one. Because I am new to SW, I am confused about this timeline aspect - what is unexplained between Episodes II and III that is hoped the final shows of the Clone Wars will answer? Also, and this observation may be way off because I am admittedly confused about the timeline - I am wondering if that is Sabine Wren with Ahsoka Tano. Yay! The Clone Wars has been saved. We will finally get to see “The Siege of Mandalore”. I don't watch TCW but I haven't seen the SW fandom this united and happy... since the first TFA trailer. So literal best received news in years, lol. The difference in hype for this and Resistance is also hilarious. The internet would probably break if they ever decide to do a show with Luke and Ben leading up to the years before TFA.